The Advent and Christmas season is often associated with joy, love, generosity, and unity. But for many people, this time of year magnifies loneliness, anxiety, grief, and despair. While others are enjoying celebrations with their friends and families, those who are hurting often feel even more lost, abandoned, and alone than ever. "Not all Christmases are white; some are blue," Todd Outcalt writes. 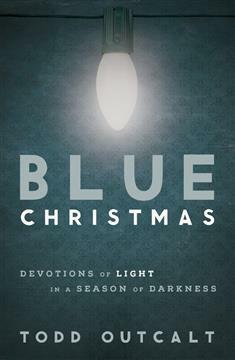 Blue Christmas is a devotional book for the 28 days of Advent and Christmas Day. Each devotion includes a scripture selection, meditation, prayer, and suggested Advent action. The book also features additional prayers, a "Blue Christmas" worship service, and reflection questions. In these honest devotions, readers will find their fears and realities named and brought into the light of God's love. They will be led to sit with their experiences, acknowledge their losses, and remember Jesus' promise "Blessed are those who mourn, for they will be comforted." Blue Christmas reminds us that all of our Christmases, even the darkest ones, can be filled with honesty and hope if we are first willing to sit in silence and bring our deepest fears to God.